Time to throw something or other on the barbie and decant a pint of 10W-40 on the ground, because GM is planning to cease Holden manufacturing in Australia by 2017. 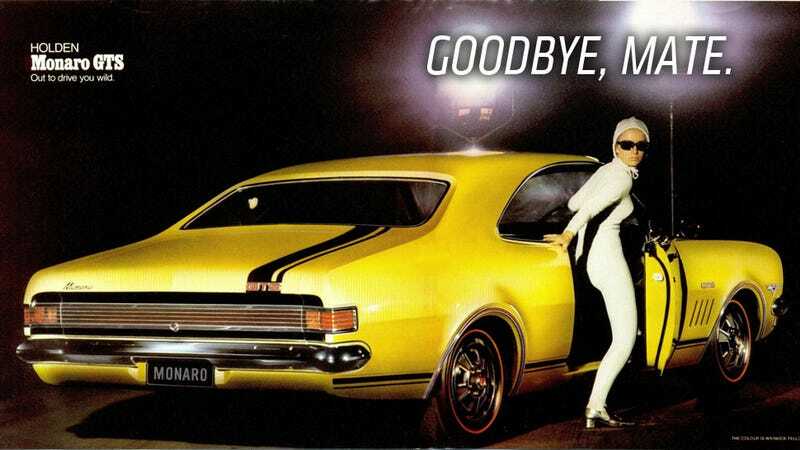 This looks to be the end of the Holden brand for GM cars, though the Holden subsidiary will continue as a sales organization and design center. "We are completely dedicated to strengthening our global operations while meeting the needs of our customers. The decision to end manufacturing in Australia reflects the perfect storm of negative influences the automotive industry faces in the country, including the sustained strength of the Australian dollar, high cost of production, small domestic market and arguably the most competitive and fragmented auto market in the world." Nearly 3,000 jobs will be affected by the decision, though GM says that transitioning workers to other positions will be a priority over the next four years. It is a shame to see Holden go. Holden has been Australia's biggest native brand, and has produced many interesting cars over the years, including what may be the best example of automotive convergent evolution, with Holden developing cars that were perhaps more similar to American cars than anywhere else in the world. How The Hell Did Someone Register A Holden Ute In New York? I'm pretty sad to see Holden go; they're incredibly rare here, and I'm not exactly sure I've even ever seen one in person, but I always liked knowing they were out there. So long, Holden. Say hi to Pontiac for us.